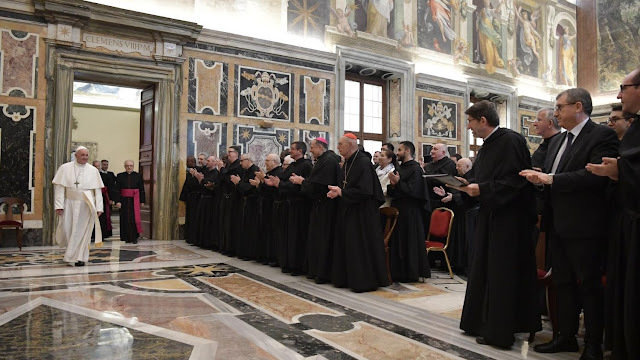 At 12 o'clock today, in the Clementin Hall of the Apostolic Palace, the Holy Father Francis received in audience the Teachers and Students of the Patristic Institute "Augustinianum" on the 50th anniversary of the foundation of the Institute. I am pleased to welcome you on the occasion of the 50th anniversary of the foundation of the "Augustinianum" Patristic Institute. I thank Father Alejandro Moral Antón, Prior General of the Augustinians and Moderator General of the Institute; I greet the Dean, Father Giuseppe Caruso, the councilors, the collaborators, the members of the Faculty, the administrators and the students. In a special way I greet one of your Augustinian confreres who was one of the founding fathers of the Institute, Cardinal Prospero Grech. And I would also like to greet the many professors emeritus, who are not here, but who have left a trace in the Institute. And I remember Professor Maria Grazia Mara, who has taught many things and who still teaches and teaches catechesis to children at the age of 95. Even Cardinal Grech: the homilies are just simple ... The sages, when they arrive at that age, become of a grandiose simplicity, which is so good. Thanks to all the elderly, to the teachers who are retired. I am delighted to have this opportunity to share the Jubilee anniversary together with you. First of all this means giving thanks to God for all that the Augustinianum has been and has accomplished for half a century. But the present circumstance invites us to go back with grateful memory up to the origins - remembered a little while ago by Father Prior -, when, within the centuries-old tradition of the Augustinian Order, the Studium dedicated to the sacred sciences was born in Rome, in particular to the Fathers of the Church, in Sant'Agostino and its inheritance. As a depositary of the great Augustinian "school", based on the search for wisdom, the Augustinianum was founded to help preserve and transmit the wealth of the Catholic tradition, especially the tradition of the Fathers. This contribution is essential for the Church. It is always, but especially in our time, as St. Paul VI said in the inauguration speech of the Institute: "The return to the Fathers of the Church - he said - is part of that ascent to Christian origins, without which it would not be possible to implement the biblical renewal, the liturgical reform and the new theological research desired by the Second Vatican Ecumenical Council "(May 4, 1970). And St. John Paul II, visiting the Institute in 1982, confirmed this delivery by saying, among other things, that "putting oneself at the school of the Fathers means learning to know Christ better and to know man better" and that "this knowledge [ greatly helps the Church in [her] mission "(May 7, 1982). Therefore, I encourage you to be faithful to your roots and your task; to persevere in the commitment to communicate the intellectual, spiritual and moral values ​​that can prepare your students to participate wisely and responsibly in the life of the Church and in debates on the crucial challenges of our time. This service is closely linked to evangelization and helps promote the growth of the human family towards its definitive fullness in God (cf. Const. Ap. Veritatis gaudium, 1). The recent Apostolic Constitution Veritatis gaudium opens with these words: "The joy of truth expresses the yearning desire that makes the heart of every man restless until he meets, does not live and does not share with all the Light of God" (No. 1) ). The echo of St. Augustine is evident here (cf. Conf., X, 23.33; I, 1,1). In fact, he has known and expressed to the highest degree the restlessness of the human heart until he finds rest in God, who, in Jesus Christ, reveals to us the most profound truth about our life and our final destiny. In conclusion I would like to share another expression of St. Augustine, taken from the De doctrina cristiana: "As for those who will proclaim things received from others, pray before receiving them, for those from whom they will receive them, so that it may be given to them. that they want to receive from them, and after they have received it, pray that they themselves may well proclaim it, and that those for whose good it is proclaimed receive it "(IV, 30, 63). Dear brothers and sisters, as you celebrate this anniversary, be assured of my prayers. I also urge you to pray for one another - this is important in an institution, it is necessary - for the Lord to support you in your daily commitment to research, teaching and study. With affection I entrust you and the entire Augustinian Order, the community of the Institute and your loved ones to the intercession of Saint Augustine and Saint Monica, and I cordially impart my Blessing to you all. And please, do not forget to pray for me.